Test your logic, vision, language skills and physical coordination with this brain stretching board game. Brain Games is a perfect name for this thinking game where you will be challenged to use all areas of the brain. Fun for smaller groups and great for family game night, this board game is both entertaining and somewhat educational. If you can successfully complete a challenge from the four different categories then you will become the Brain Games champion (just don't let it go to your brain). Games like this are great for everyone since it isn't just trivia or just drawing. It takes advantage of everyone's strengths. Read more about how to play Brain Games with the official game rules below. Also available is a kids version tailored just for younger minds. Grab your copy of Brain Games and test out your brain. The first player to collect at least one tile from each of the four categories wins. 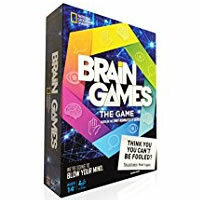 Brain Games come with 192 game cards, 40 game tiles, 6 pawns, 6 scorecards, 1 game board, 1 game die and the official Brain Games game rules and instructions. Please keep in mind that the official Brain Games board game rules and instructions could be different depending on the game version you have. The rules below are some of the exact directions on how to play Brain Games. Share with us your comments, funny stories, tips, advice, strategies, creative ways to play, questions about how to play, problems with the rules or anything you want about Brain Games. All submissions will be reviewed within 24 hours. Click here to add your Brain Games comments. On the vision card that has the alphabet in “foreshortening” perspective; can the viewer tilt the card to answer or do they have to answer just be a straight on view?